I have never understood why some people don't like leftovers. In my house, leftovers lead to the discovery of new favorites all the time. This summer, the presence of some leftover roasted corn kernels...and a leftover lemony vinaigrette...brought about the "creation" of a simple summer salad of nothing more than roasted corn, raw zucchini, arugula and the aforementioned vinaigrette. The vinaigrette (from Suzanne Goin's Summer Succotash Salad in her book Sunday Suppers at Lucques) is what sets this streamlined little salad apart. 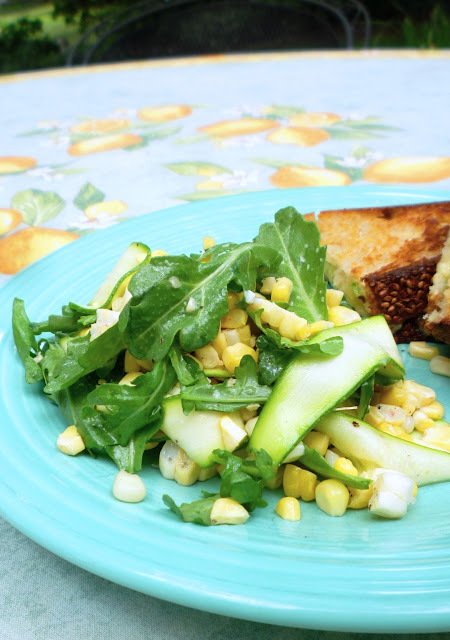 It is admittedly very lemony—some might consider it to be out of balance—but as I discovered when I made Goin's succotash salad, it is just the thing to set off fresh midsummer produce. 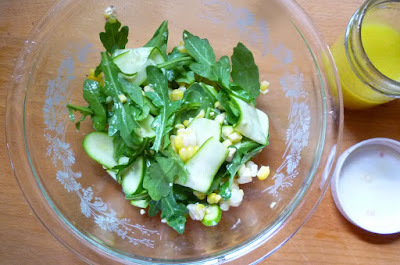 I figured it would be equally delicious on my corn and zucchini salad: I always knew that lemon was particularly good at brightening the subtle flavor of zucchini...and that an excessively peppery bunch of arugula could be magically tamed by a generous dose of lemon... 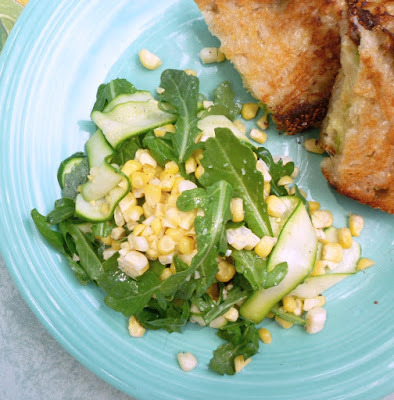 Still, I was surprised when I tossed these few ingredients into a bowl with my roasted corn (always delicious with zucchini and arugula) at the abundance of flavor. Other than the tangy vinaigrette, what makes this salad special is in fact the small number of elements. Sometimes it is so tempting to just continue to add more...particularly this time of year when there are so many delicious fresh things to eat. But restraint is almost always a good idea. I admit that I have expanded this salad on one occasion (to make a more substantial, entrée-appropriate, salad) by tossing in a handful of salty Feta and piling it all on top of a platter of sliced vine ripened tomatoes. It was delicious this way too. 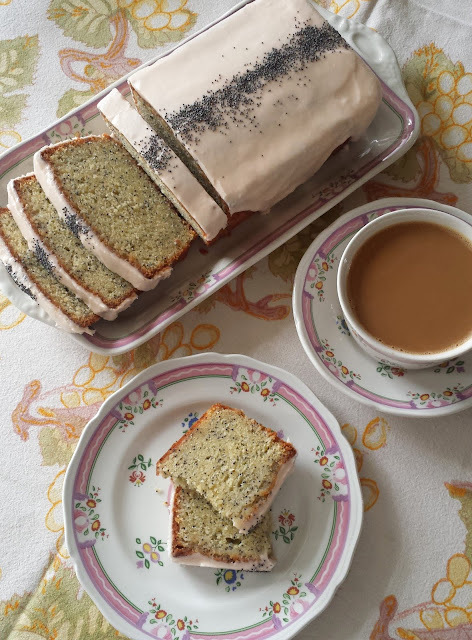 But I encourage you to try it in its simplest form first....if for no other reason than to experience just how good such a small number of ingredients can be. I have enjoyed it so much that I have started keeping a container of roasted corn on hand...sort of an "on purpose" leftover. I don't know why I never thought to do this before. 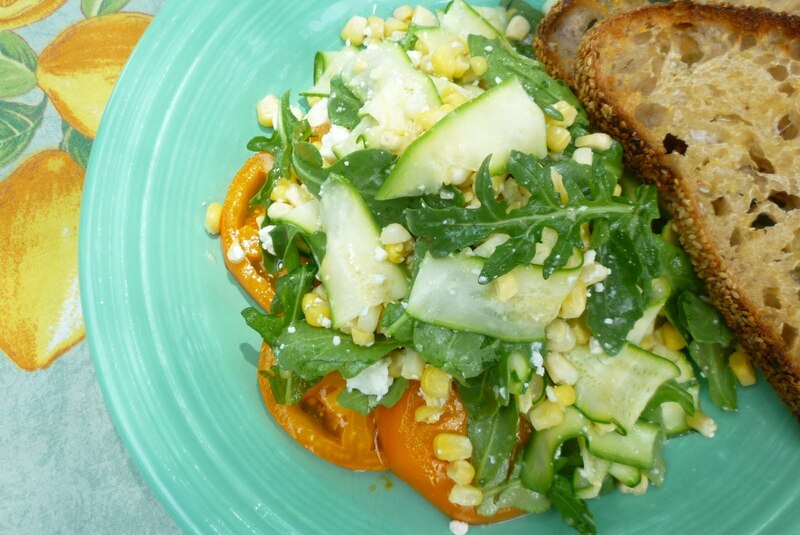 I love summer corn salads. Now, I can whip up this—or another favorite—at a moment's notice. So don't throw away that last little bit of vinaigrette or sauce, or those few remaining roasted or blanched vegetables...or that last spoonful of rice or couscous. These things can always be turned into your next delicious meal. You never know when you'll come up with a new favorite. Using a mandoline slicer, slice the zucchini very thinly lengthwise (less than 1/16th inch thick, if possible). Place in a small bowl along with the corn and season to taste with salt & pepper. Drizzle in the vinaigrette and toss to coat. Add more vinaigrette if the vegetables seem dry. Taste and correct the seasoning with salt, pepper and more vinaigrette as necessary. Add the arugula, toss well and plate. To roast corn, place the corn (in the husk) in a preheated 375­° oven. Roast for 20 minutes. Remove from the oven and remove the husks as soon as you are able to handle the corn. 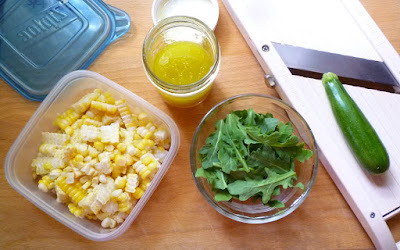 Cool and cut the kernels away from the cob. A large ear of corn will produce about 1 cup of kernels. Feta (3/4 to 1 oz. 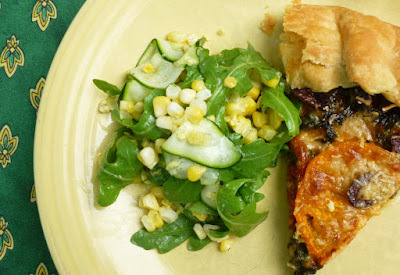 per person)—Crumble and add with arugula...or sprinkle over plated salad. Place the shallot, 3 T. lemon juice, and 1/2 t. salt in a bowl and let sit 5 minutes. Whisk in 5 T. olive oil. Taste for balance and seasoning. 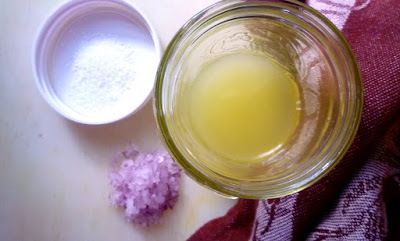 Rewhisk before using. Makes about a half cup of vinaigrette. Store, tightly covered, in the refrigerator. Bring to room temperature before using.